September 2018: Members of the Concept Task Force have been working over the summer to explore preliminary route options that satisfy the service standards established by the Guiding Principles. We look forward to sharing our work with the community and gathering input and feedback on the concept in fall 2018. 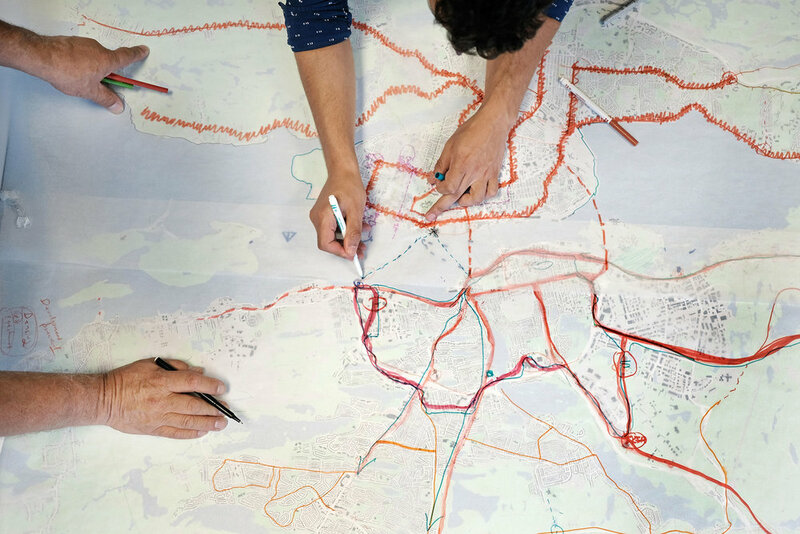 Members of the concept team work together on preliminary route design. Preliminary transit route sketches showing catchment areas. Tim Houston, leadership candidate for the PC party of Nova Scotia issued a press release May 17th, 2018 calling for less congestion and better transit, specifically where it pertains to more rural parts of HRM commuting to the regional centre. Houston indicated that his intention, if elected, is to consult with a number of organizations, including Leading with Transit, on implementing a future regional transit plan. See the full press release here. StarMetro reporter Tristan Cleveland gave a shout out to Leading with Transit in his article about the potential for Sackville Drive as a main street. Leading with Transit is the key to unlocking that potential. See the full article here. April 6, 2018, Halifax, NS – The recently formed coalition of transit advocates, Leading with Transit, will hold a series of public forums to discuss and gather feedback and recommendations on the future of transit and the city. A total of four forums will be held in Dartmouth, Spryfield, Sackville, and Halifax. At each forum, there will be a presentation of best practices transit principles, question and answer period, and small-group workshop and discussion. The public is encouraged to attend and participate. See the full release here.